It's not often that I see these available in their raw form so it's no surprise that I just to get some. 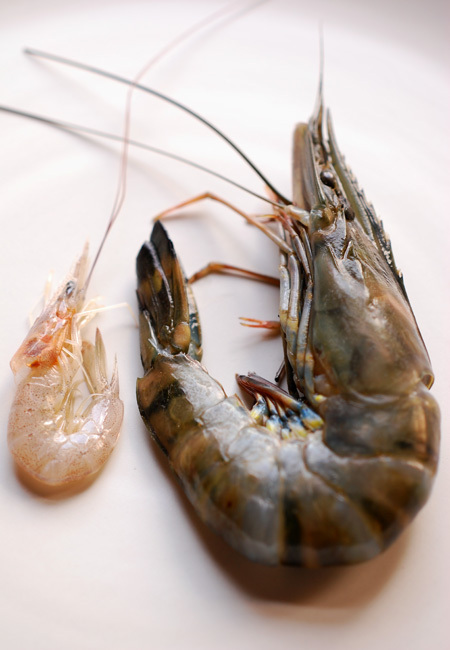 By itself, you really don't get any indication of their size, or lack of it so I thought a comparison shot taken with a normal sized Tiger prawn would help - I should add that this was one of the larger school prawns in my stash. 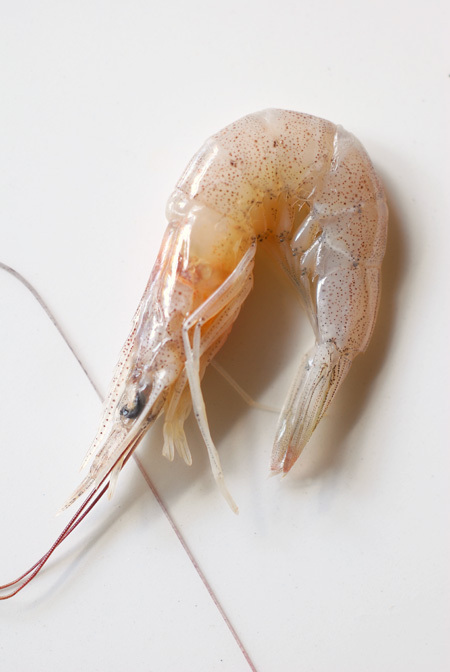 School prawns have a sweeter flesh and are more usually sold cooked, due to their short shelf life. This is a dish that won't go down well with those that don't like their food looking at them but believe me, it's an incredibly delicious way to enjoy these prawns - what's more, you eat everything, from head to tail! Lay the prawns on paper towels on one level and place in the fridge for at least 30 minutes to soak up any excess liquid. 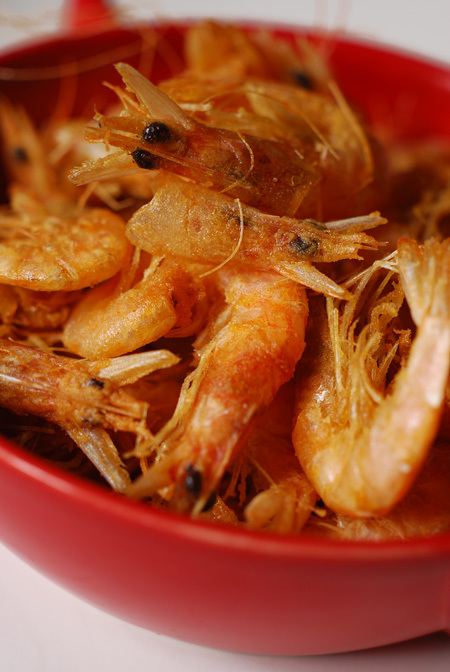 Place the flour in a bowl and add the dried prawns - toss them well to ensure they are well coated. Take a handful of these floured prawns and place them in a sieve - shake them to eliminate the excess flour - it's important that the prawns have just a whisper of flour over them. Repeat with the remaining prawns. Most of the flour will be left in the bowl - discard it. 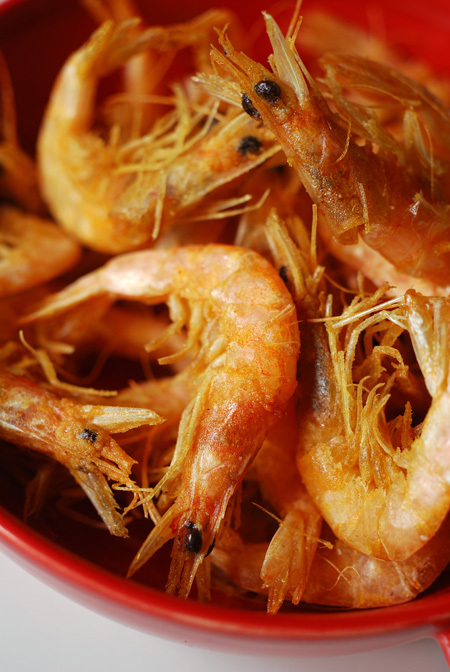 Only flour the prawns when you are ready to deep-fry them. Use a deep-pan or a wok and using a good neutral oil, heat it until it reaches 180°C/350°F. You can then cook the prawns in batches until golden and crisp - this will take a couple of minutes. Drain on paper towels to remove any excess oil and then sprinkle over with the celery salt. Serve immediately with lemon or a good aioli. 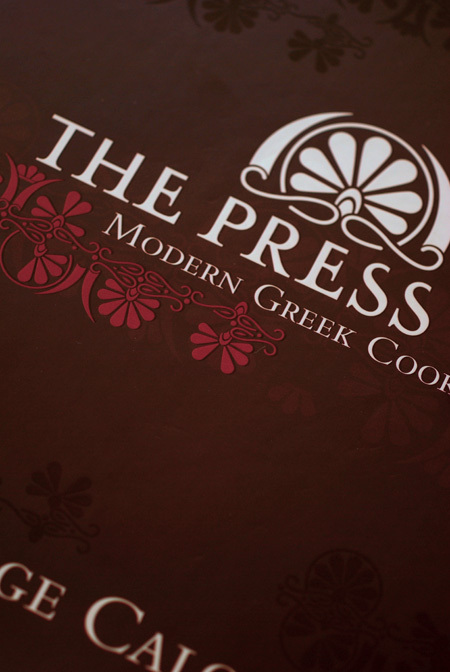 I was struck with your mention of a Greek dish. I've never heard of this fellow but I'll do a search. As for prawns, at the very least...such the juices out of the head...Ummm! Wow, that's huge! Looks delicious, too. Very interesting post. I had no idea they could be that big. Would love to try them! Yummmm. I tried deep fried shrimp heads for the first time at a sushi place, where we had just become best buds with the chef and he insisted that we try some. It was phenomenal. The only thing keeping me from replicating your recipe is a persistent phobia of deep fat frying. Thanks for the great photos! Don't s'pose you'd come the raw prawn with me...and tell me where you got them. I've been looking for these little fellas everywhere, there's a million things to be done with them. Heads and tails, it's all about the flavour, I have no problem with that. Hi Neil - Theo's at Prahran Market is where I found these. A few weeks ago they even had live prawns - unfortunately I found out after they had all gone. I couldn't agree more with George Calombaris. At work we use the brains of all the crustaceans we use. When I prepare the lobsters for our maki I take out every drop of juice from the heads and blitz in the thermomix at 50 degrees until it turns pink and thickens. We also use the brains from the gambas rojas to enrich our salsa suquet and the brain liquid from our langoustines is chilled and used in a hot/cold combination with a warm langoustine gelatine. Hi Trig - oh now I have another reason to get a Thermomix! Mmmm - these look lovely, wish I could try some! I'm thinking my fishmonger may not be able to get this variety though...! Thanks Kittie - they are very hard to find here as well, I think the restaurants buy it all!